ST. AUGUSTINE, Fla., Apr. 22 /CSRwire/ - Ethical Markets Media welcomes Earth Day with a stunning new total for its Green Transition Scoreboard® (GTS). As of Q4 2015, the GTS totals $7.13 TRILLION cumulative in non-government investments and commitments tracked since 2007 in the global green transition now underway. 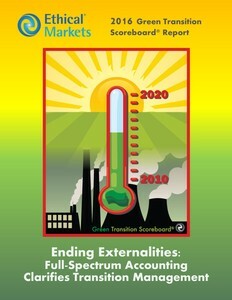 The 2016 report, “Ending Externalities: Full-Spectrum Accounting Clarifies Transition Management”, focuses on the top priority: ending “externalities” which the IMF estimates at $5.3 trillion annually worldwide. Companies tracked since 2007 by the GTS are those avoiding negative externalities and focusing on transition management to low-carbon economies agreed by 195 member countries of the United Nations’ Sustainable Development Goals (SDGs) and the COP21 climate agreements in Paris in 2015. Each GTS sector covers substantial capital investment in areas which Ethical Market’s president and founder Hazel Henderson's years of research as a science advisor and which the Ethical Markets Advisory Board expertise indicate are strongly contributing to the growing green economy. The GTS tracks Renewable Energy, Energy Efficiency, Life Systems, Green Construction and Corporate Green R&D, representing broad areas of investment in green technologies. Life Systems gained a new category: Fintech for sustainability, including peer-to-peer lending and crowdfunding, in addition to other subsectors tracking the system-wide interconnections among information and digitization, water, food, education and health. “The upward trend in investments since 2007 aligns with our recommendation to invest at least 10% of institutional portfolios directly in companies driving the global Green Transition,” says Henderson. Updating strategic asset allocation models serves both as opportunities and as risk mitigation. Excluding government investments to the extent possible, the $7.13 trillion in private investments and commitments as of 2015 puts private investors on track to reach $10 trillion in green sector investments by 2020. Ethical Markets strictly defines 'green' by omitting technologies such as nuclear, clean coal and most biofuels while carefully assessing rapidly advancing technologies such as nanotech and IoT (Internet of Things). Sources of financial data are screened by rigorous social, environment and ethical auditing standards. Renewable Energy – Growing strongly as fossil fuel becomes less appealing in light of cost parity of renewables, limiting carbon emissions and driving evolution to sustainable societies. Energy Efficiency – Widespread ripple effects positively impact jobs creation, manufacturing and other metrics tracked by traditional GDP and integral to transition management, quality of life metrics reported in Life Systems. Life Systems – Encompasses broad areas systemically linked, including water, remediation, waste and recycling, green infrastructure and info-structure, education, community investing and the myriad of digitization opportunities and obstacles, investments often overlooked as too small, such as the Fintech 100, 2015. Green Construction – This sector ranges from “low-tech” passive solar buildings to “high-tech” flow 3D printing. For consistency, we omit labor, thus undercounting a form of capital which intrinsically increases the value of green construction. Corporate Green R&D – Powered by the automotive industry, this sector is also heavily weighted in favor of energy generation, conservation and distribution with a precipitous decline in fossil fuels P&E. Ethical Markets Media (USA and Brazil), Certified B Corporation, is a micro-multinational social enterprise with the mission of reforming markets and metrics while helping accelerate and track the transition to the green economy worldwide with the Green Transition Scoreboard®, Ethical Biomimicry Finance®, Transforming Finance TV Series and research and daily news at www.ethicalmarkets.com.